We have two and three bottle Holiday Packages with special pricing (up to 25% off) ready to be shipped for the holdays. It’s not too late! Just provide the names and address and we will wrap each bottle in holiday tissue, add a holiday card with your greeting, and ship it for you. Contact us by Dec. 19th for regular rates at 805-344-2107, email us, or visit our website. Join the entire town of Los Alamos for an old-fashioned, community Holiday celebration from 5-7 pm. All shops will be open with caroling, tree lighting, luminarias, and more along with our own electic version of holiday cheer. Ukulele virtuoso Kevin Carlson will entertain while Stephan makes wood-fired Christmas Calzones. No Charge except for wines by the glass. 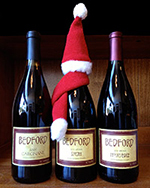 You are currently browsing the Bedford Winery blog archives for December, 2013.